Due to its height, Pamukkale can be seen from Denizli, which is located 20 kilometers away. When you translate “Pamukkale” it means “Cotton Castle”. There are 17 hot water springs spread over the Pamukkale area. Pamukkale has over 2 million visitors every year. Pamukkale became a UNESCO World Heritage Site in 1988. There is a cave called “place of the god Pluto”, which was used for religious purposes in the past. 6 How long to stay in Pamukkale? While most people will tell you to enjoy the sunset when visiting the travertines I have to tell you: You can’t really enjoy it with the masses of people joining you there. Without a doubt, the sunsets there look absolutely magic and if you are there anyway: go for it. But if you have to decide between sunset and sunrise I can highly recommend you to decide for sunrise. The park opens at 7.30 AM and for the first hour I was there absolutely alone (with some cute dogs) – a perfect opportunity to take beautiful images or just truly enjoy the whole beauty of this place. During the rest of the day, I felt more like I was in a metro of a huge city – fighting for a good place. Just be sure to check the times of sunrise and sunset in advance – to not miss it. During sunrise, I was completely alone, definitely worth it. I have to admit: The sunset looked pretty insane! Once you made it into the National Park you will also find Hierapolis, an ancient city, which was built 2 centuries B.C. Together with the travertines of Pamukkale, it is included to the UNESCO World Heritage list. 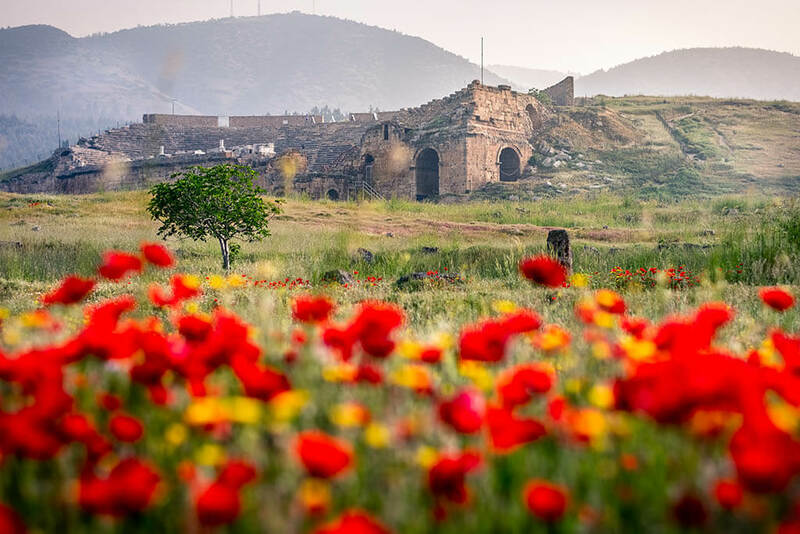 Hierapolis was a flourishing city during the Roman Empire – and you can still see some parts of its beauty. Hierapolis was destroyed several times and rebuilt afterward – and was kind of a hidden gem for me – as it is not as famous as the travertines. You will also find a museum which has a collection of ancient artifacts and is especially interesting if you like to know more about its history. 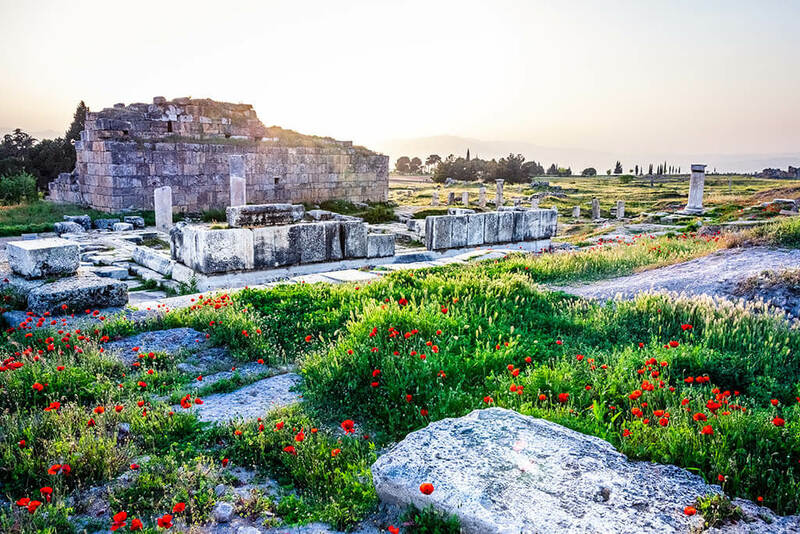 Actually, the theatre of Hierapolis is also part of the ancient city itself – but was just too beautiful and impressive to not make it an extra point on this “things to do in Pamukkale” list! I saw quite a few ancient theatres so far – and I have to say that this was one of my favorites! It was not the biggest I’ve ever seen but was in a fantastic condition. The short “hike” up there (just a few minutes) can be quite painful in summer (at least I imagine! ), so definitely bring enough water with you. However, the views from up there are really rewarding and it’s one of the best places to see in Pamukkale! The pool is filled with pure and clean warm water and contains different artifacts from the Roman Empire. The combination of the healthy and warm water with all those artifacts made it really special to spend time there – almost feeling like Pharao Michael. Well, there is an extra entrance fee for Cleopatra’s pool, so I didn’t feel like a Pharao for too long! In my opinion, it was totally worth the money though. If you don’t want to spend more money it is also possible to relax around the actual pool – which is also not too bad, as the whole area is pretty cozy. Most stores inside the area are quite expensive, so you have to look around a bit to find food for a fair price. Nearby Pamukkale you can also find two other really interesting ancient cities: Laodiceia (25 minutes) & Aphrodisias (1h 30minutes). As they are pretty similar to Hierapolis we only visited Laodiceia, which was pretty fascinating. Especially the former main street of the city was absolutely impressive. You can see former baths, temples, a gymnasium, theatres and a stadium there. In my opinion, you should at least add one of these places to your Pamukkale Itinerary – you will not regret it! Denizli is the biggest city and capital of the area – and only 50 minutes by car from Pamukkale. I didn’t visit the city myself but saw some pictures from the view you get when taking the cable car up to some hills. It is called “Denizli Teleferik” and will bring you to 1’500 meters above sea level – including some amazing views. So if you start your trip from Denizli or want to see something not every tourist sees: Go for it! If you do so let me know in the comments how you liked it! The Turkish Maldives – sounds awesome, right? And it certainly was! The Salda lake, which is a big crater lake around one and a half hour away from Pamukkale, is definitely worth a side trip when staying in Pamukkale. 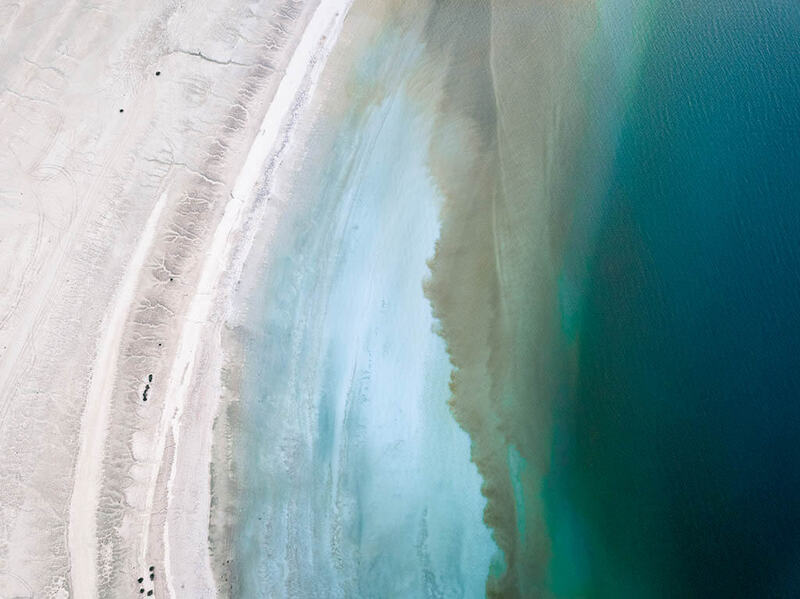 This beautiful lake got its nickname “Turkish Maldives” because of its incredibly beautiful shore, which really looked like I imagine the Maldives (I haven’t been there yet though!). What I really liked about the place was that it wasn’t crowded at all – and therefore truly peaceful. In Summer there is also a famous music festival, which some Turkish people recommended me after my trip. If you stay in Pamukkale for some days the Salda Lake is for sure something you got to put on the things to do in Pamukkale and is, in my opinion, a great day trip from Pamukkale. When I went to the travertines of Pamukkale I saw some paragliders flying over this beautiful place – during sunset. I thought: This is definitely something that must be so much fun! As paragliding is quite affordable in Turkey (around 80$ for a flight) and you will have an amazing view over the travertines from the air this is something you should consider when doing a trip to Pamukkale. You can book your flights online in advance. Are you interested in paragliding? Check out my guide about Fethiye, Turkey’s paragliding paradise. 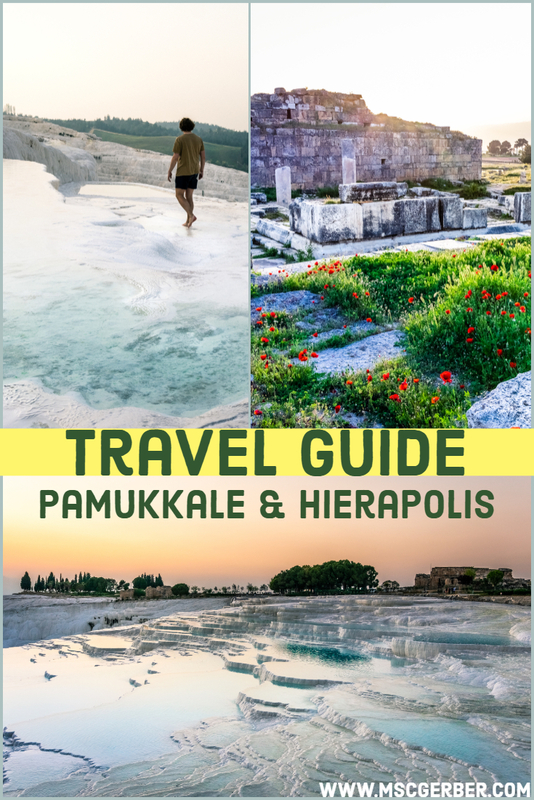 Due to the huge number of tourists that are visiting Pamukkale every year, there are many options – in my opinion for a great price – to choose from. Most of the hotels also include meals and spa – which makes sense with the healthy water coming from the region. I personally stayed in Richmond Pamukkale, which wasn’t as fancy as I expected it – but was a good value for the money we paid. Including (buffet) breakfast, dinner, and a big spa area. 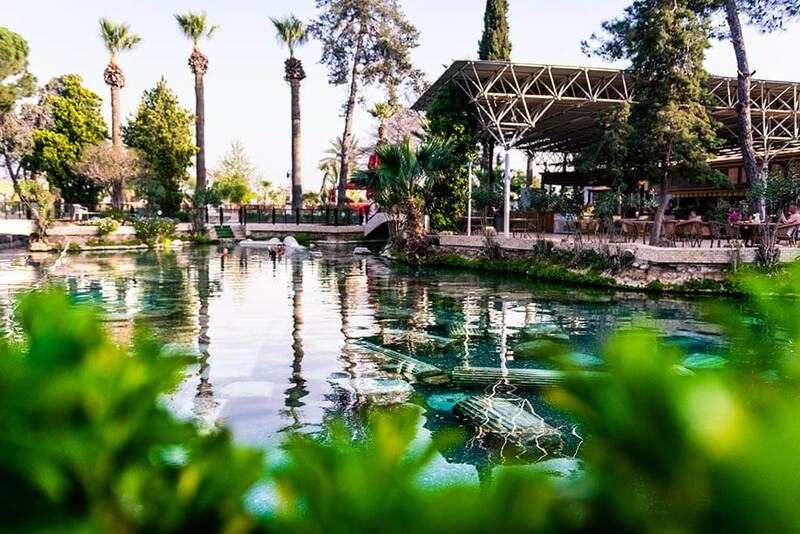 One of the best-known hotels in Pamukkale is the Doga Thermal Hotel, which is more expensive but has extraordinary ratings and also just looks amazing. A cheaper (but not worse) option would be the Hotel Pamukkale, where you can sometimes find rooms for under 30$. The hotel has top-notch ratings on every site I’ve checked during my researches. The best time to visit Pamukkale is probably spring, where you can enjoy pleasant weather conditions. During summer (really hot) or winter (possible snow), you might need some luck to really enjoy your trip. Another good time would be fall – however, the days there are already way shorter than in spring and the chances of rainfall are much higher. In general, Pamukkale is always worth a trip though. The closest airport is located in Denizli, which is around 65 kilometers (or one hour) away from Pamukkale. There are several bus companies and shuttle services available to bring you from Denizli to Pamukkale. The second nearest airport is in Izmir, which is located over 250 kilometers away from Pamukkale. Yet, there are trains or buses that can bring you from Izmir to Pamukkale if you wish. The good thing about Turkey: You have amazing bus connections – including overnight buses. You can basically find a bus connection from every major city to Denizli – and just take a shuttle bus from there. From and to Göreme (Cappadocia) there are even direct bus connections available. There are direct trains from Izmir to Denizli – from where you can, once again, take the shuttle buses to reach Pamukkale. As the train connection is pretty slow and it’s hard to find information on the internet I would probably go for a night bus instead. Of course, you can also reach Pamukkale by car – like we did it from Cappadocia. The highways in Turkey are in amazing conditions and you can reach Pamukkale quite easily by car. How long to stay in Pamukkale? This is always an important question – and I have a clear answer for you: At least two days! 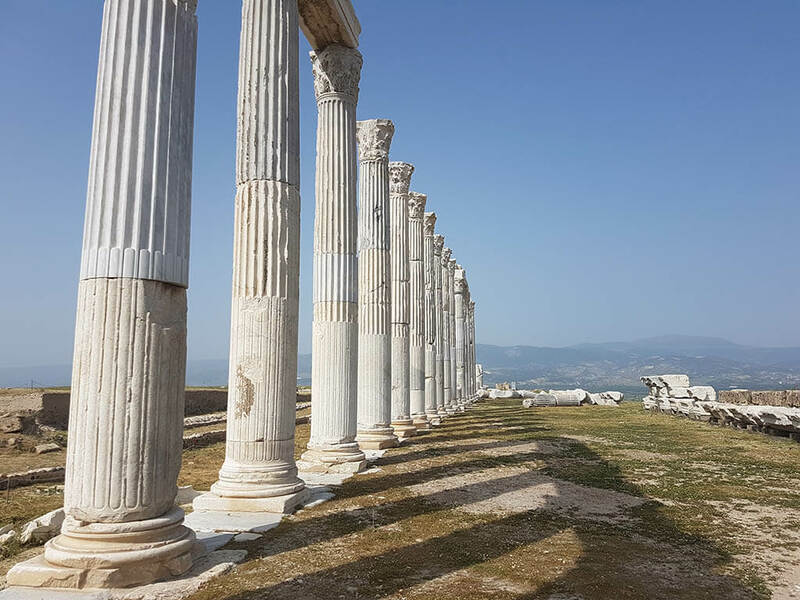 Of course, it is possible to visit the travertines, Hierapolis and even some other places in the area in just one day – and to be honest, that is what probably most tourists do (when they approach the travertines with huge buses). I highly recommend you to not do it! In my opinion, you should get up really early in the morning to visit the travertines without the masses of tourists, and then also explore Hierapolis and enjoy some time in Cleopatra’s pool. On the second day, you could explore one or both of the other ancient sites mentioned in this guide or, if you prefer nature, even visit Lake Salda. 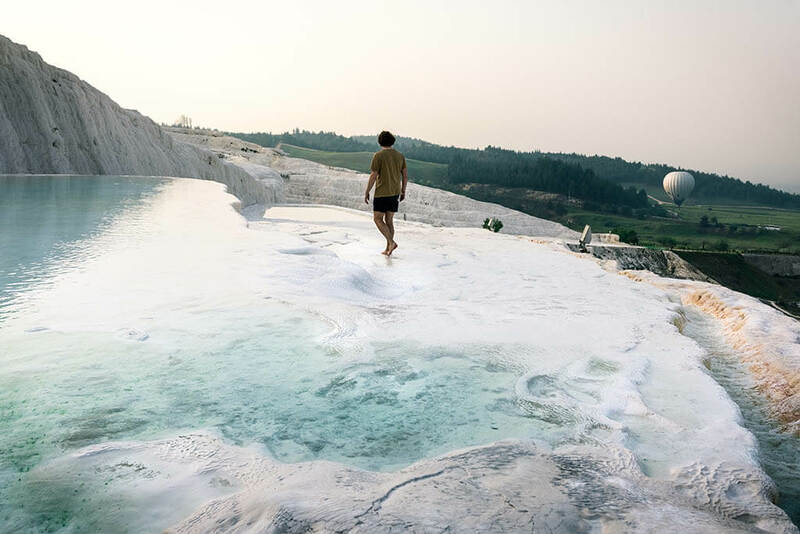 I personally stayed even longer in Pamukkale and relaxed a bit from our really tough programme in Cappadocia – because we shouldn’t forget: Pamukkale is actually a perfect place to relax. Have you ever been to Pamukkale? 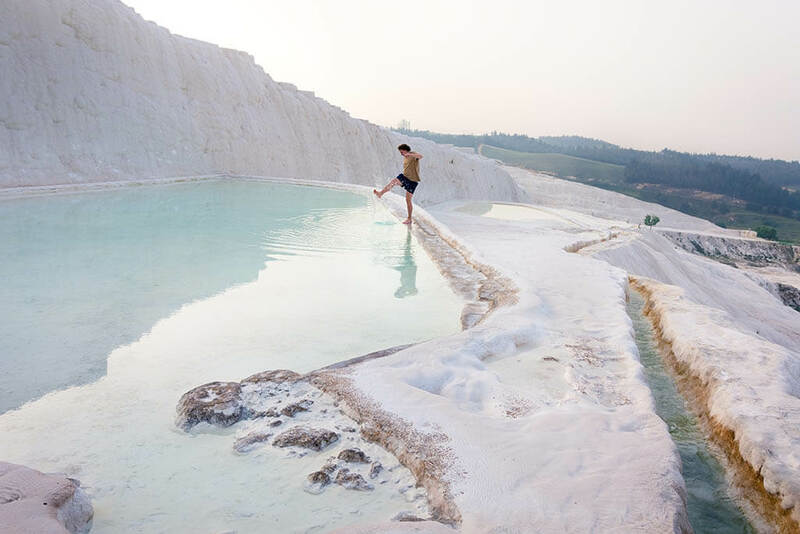 How did you like it and which was your favorite thing to do in Pamukkale? Let me know in the comments!